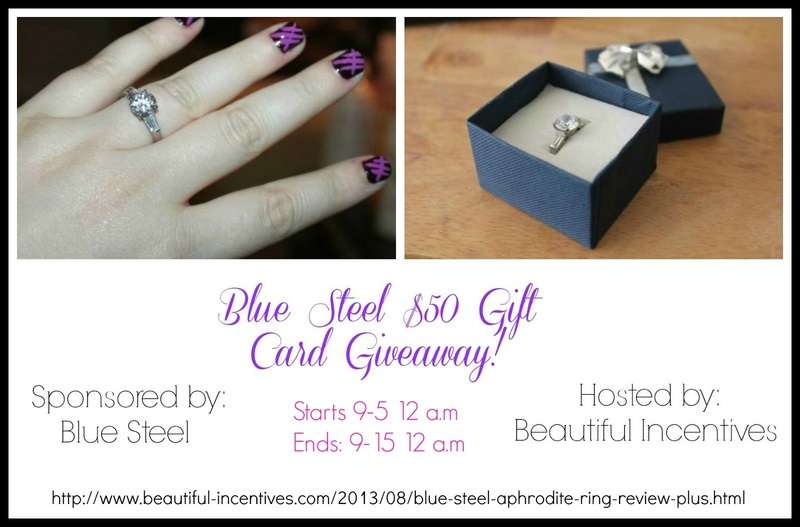 Beautiful Incentives: Blue Steel Aphrodite Engagement Ring Review. Plus $50 Gift Card Giveaway! 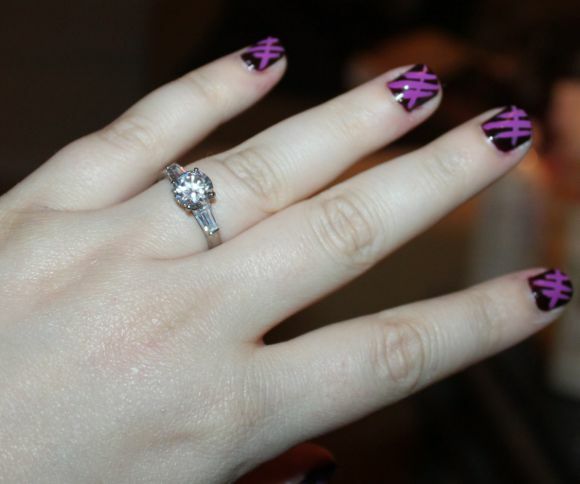 Blue Steel Aphrodite Engagement Ring Review. Plus $50 Gift Card Giveaway! I haven't had the chance to review many jewelry items so I was ecstatic to have the opportunity to work with Blue Steel. They have the most gorgeous designs that are fairly priced and always on sale. What makes them really special is that they offer stainless steel jewelry, which is much easier to handle and does not corrode over time. They do offer Sterling silver as well. I love jewelry, but I am picky and my rings have to be thin and dainty. Not clunky in the slightest. Blue Steel has just what I needed. Finding jewelry at an affordable price can be daunting and to come across this store is a wallet saver. Stainless steel is a lot cheaper in price and looks just a pretty. Does this ring look fake to you? If you have normal eyes, the answer is no! Today I am reviewing a beautiful stainless steel Cubic Zirconia ring, named the Aphrodite. The name is perfect for this ring. It is a thing of beauty, taking after Aphrodite, the Greek Goddess of Beauty. It is gorgeous! The picture does it no justice though. You should see how it shines and sparkles in any light in person. It is just kind of magical. Giving this to a loved one would surely get you brownies points or for yourself. We all deserve a treat! 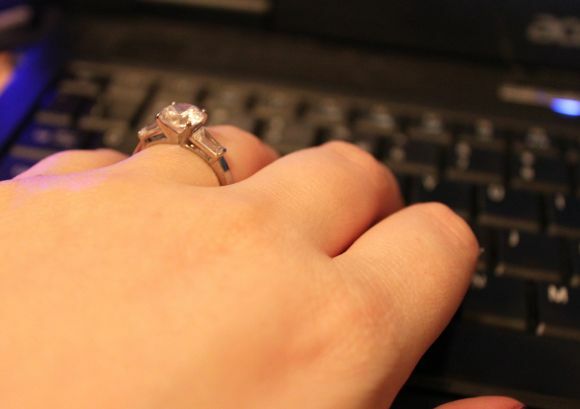 I don't even have to angle the ring to show how brilliant it sparkles. It just does it effortlessly. This last picture is without flash. See what I mean about the Sparkle?? Really pretty right? What can we attribute to the beauty of this ring? This ring is full of beauty and sparkle, just like it's name, Aphrodite-the goddess of beauty. It is entrancing with its round-cut center Cubic Zirconia stones, 3-carats of stunning beauty on a stainless steel high polished setting. Aphrodite makes for the perfect wedding, engagement or just a special occasion "I love you" ring. 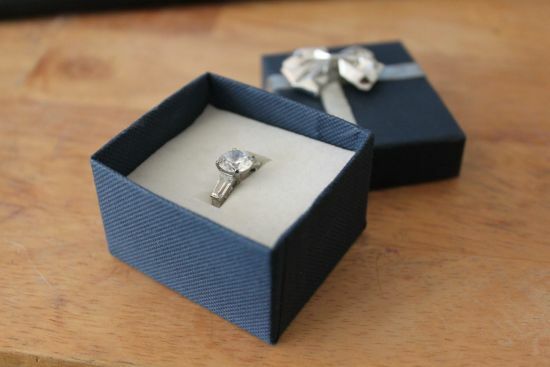 It comes in a cute blue box with a silver bow, perfect for gifting! They have a helpful sizing feature to help you figure out your ring size and they carry so many gorgeous designs you will have a hard time picking just one! Blue steel has a 30 day satisfaction guaranteed or your money back policy, so you can feel confident shopping with them. They also offer FREE shipping when you spend over $100! they have FREE gift packaging as well and they ship fast. And now, what you're really here for... I 'm excited to be able to offer one of my readers a $50 Giftcard to go toward anything in the Blue Steel store! Give the rafflecopter about 10 seconds to load. It is being Wonky! Thank you for your patience! 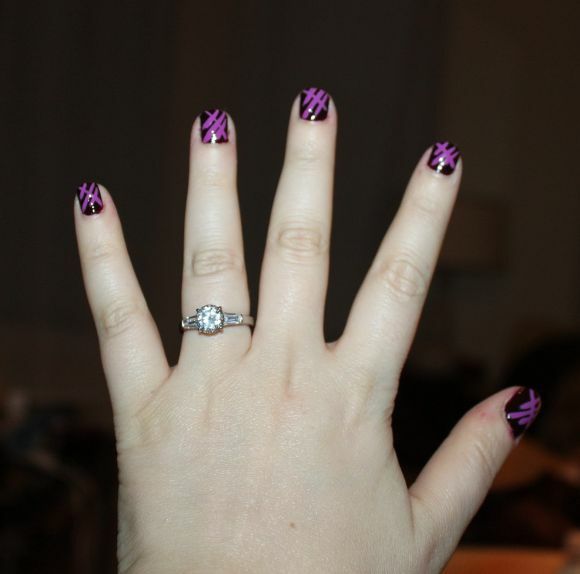 I love that ring, but love the nails even more! I love the BLACK PARAGON ring, it's gorgeous! The wings of love earrings are gorgeous! Thank you for this giveaway! I love the Sparkle Blossom - Cubic Zirconia’s Flower Design Stainless Steel Engagement Ring!! I would buy the Traditional Buddhist Coffee and Black Shamballa Bracelet. I would love to buy the Omega - Sleek and Sophisticated Sterling Silver Wavy Omega Style Necklace! the Traditional Buddhist Coffee and Black Shamballa Bracelet. I might get the Garnet Swirl - Thin Swirl Design French Wire Silver and Garnet Sterling Silver Earrings. I like the Garnet Swirl too.. but still undecided. I think I would get the ostara ring! Laurel Vine Earrings! They are beautiful! I would probably get the HEARTBEAT - TRIPLE HEARTS CLASSY DESIGN GOLD AND STAINLESS STEEL ELEGANT STYLE BRACELET! It would look be great on my sister! This is lovely "Steel Roses - Pink - Impressive Floral Design Stainless Steel Pink Cuff"
I like the shooting stars ring. I would buy the All You Need Is Love - Stainless Steel Pendant LOVE and Heart with Cubic Zirconias. I would buy the Tungsten Wedding Band - Tungsten Carbide Shiny Finish Traditional Wedding Band because my husband lost his ring.